A United Launch Alliance (ULA) Delta II rocket (Delta 347) has launched from Vandenberg Air Force Base this morning carrying the Wide-field Infrared Survey Explorer satellite for NASA. The launch occured at the start of a fourteen minute window, which opened at 6:09am Pacific (14:09 GMT). The Wide Field Survey Explorer, or WISE, is a 674 kilogram (1485 pound) satellite, which NASA will use to conduct infrared astronomy. Its primary mission is to conduct an all-sky survey, whilst it will additionally conduct observations related to galaxies with high luminosity, and the nearest stars to Earth. It will also be used to produce a catalogue for use by the James Webb Space Telescope, when it is launched. WISE will serve as a replacement for the Wide-field Infrared Explorer (WIRE), which failed within hours of reaching orbit in 1999. WISE is equipped with a 40 centimetre IR telescope, which is cooled to less than 17 Kelvin by a two-stage two stage cryostat using solid hydrogen as a coolant. Work to fill the cryostat began on 29 October, and concluded on 12 November. The hydrogen was kept solid by coils containing liquid helium, which cooled the hydrogen. The helium cooling was terminated yesterday in preparation for launch. If the launch does not occur within two days, a delay will be necessary to re-freeze the hydrogen. It is expected that once in orbit, the hydrogen will last for around ten months. The satellite was built by Ball Aerospace, and is based on the RS-300 bus. It has an expected lifespan of seven months. WISE is a Medium Explorer (MIDEX) satellite, forming part of the Explorer programme. If it reaches orbit it will be designated Explorer 92. The first Explorer satellite, Explorer 1, was launched on a Juno I rocket on 1 February 1958, and became the first US satellite to successfully reach orbit. To date, 89 Explorer satellites have reached orbit, with several more lost in launch failures. Initially Explorer designations were given to all satellites regardless of launch outcomes; however since 1959 the designations have only been given to satellites that reached orbit. The target orbit for the WISE launch is one with a semi-major axis of 6,912 kilometres (3,732 nautical miles), eccentricity of 0.00133, and 97.5 degrees of inclination; a retrograde low Earth orbit with approximately 530 kilometres altitude. Delta 347 is a Delta II rocket which uses the 7320-10C configuration. At launch, its first stage will be augmented by three GEM-40 graphite-epoxy motors – small solid boosters used to provide additional thrust during the first minute of flight. The 7320-10C is a two-stage configuration, with an Extra-Extended Long Tank Thor (XLTT) first stage, and a Delta-K second stage. A 3 metre (10 foot) composite payload fairing will encapsulate the spacecraft. The Delta II entered service in 1989, and is one of the most reliable rockets currently in service; having made 146 flights to date with only one failure and one partial failure. After Delta 347, another four Delta II flights are currently planned before the rocket is retired from service, however it is believed that additional rockets are available should further launch contracts be signed. Today’s launch will be the thirty-seventh to be conducted by United Launch Alliance, which was formed in 2006 to supply orbital launch services to the United States government. If the launch occurs today, it will be on the third anniversary of ULA’s first launch, which was conducted using a Delta II 7920-10C flying from the same launch complex. That launch, designated NRO L-21, placed the USA-193 satellite into orbit; a spacecraft which malfunctioned immediately after launch and was destroyed in 2008 by a modified SM-3 missile. The RS-27A main engine of the first stage, which burns RP-1 propellant oxidised with liquid oxygen, will ignite about two seconds before launch. At liftoff, the solid rocket motors will ignite as well, and Delta 347 will begin its ascent. It will fly downrange along an azimuth of 196 degrees from Vandenberg, passing through Mach 1, the speed of sound, 35.7 seconds into the flight. Fifty seconds after launch, it will pass Max-Q, the point at which the vehicle will experience maximum dynamic pressure. Sixty four seconds after launch, the solid rocket motors will burn out. They will remain attached for a further thirty five seconds in order to clear oil rigs off the coast of California in the interests of range safety. One hundred seconds into the flight, a dog-leg manoeuvre to adjust the rocket’s trajectory will commence, lasting forty seconds. Just over two hundred and sixty two seconds after lifting off, the first stage will cut off, an event known as MECO. Eight seconds after MECO, the first stage will be jettisoned, and the second stage’s AJ-10 engine will ignite after a further five and a half seconds, burning hypergolic Aerozine-50 propellant with dinitrogen tetroxide oxidiser. Two hundred and ninety seconds after launch, the payload fairing will separate from around the spacecraft. Six hundred and twenty two seconds into the flight, and following a burn lasting about five minutes and forty five seconds, the second stage will shut down having completed its first burn. With the first burn complete, Delta 347 will begin a coast phase, during which time it will reorient itself to provide better thermal conditions. The coast will last until 51 minutes and 40 seconds into the flight, at which time restart will occur, beginning the second stage’s second burn. This burn will last eight and a half seconds, and will be followed by the upper stage manoeuvring to the correct attitude for spacecraft separation. Fifty five minutes and twenty seconds after launch, the spacecraft will separate from Delta 347. The separation will be observed by an Ecliptic Enterprises RocketCam camera mounted on the upper stage. Following separation, Delta 347 will perform additional manoeuvres to raise its orbit, in order to mitigate debris in low Earth orbit. Delta 347 will launch from Vandenberg Air Force Base’s Space Launch Complex 2W (SLC-2W), which was originally built for tests of Thor IRBM during the late 1950s and early 1960s. Originally designated LC-75-1-2, the first launch from the complex was conducted by the Royal Air Force in 1959, using a Thor missile. The Delta II has used the complex since 1995. This is the seventh Delta II launch to occur this year; the last time the rocket is expected to achieve such a high flight rate. It is also the twenty-fourth and last American orbital launch attempt of the year. 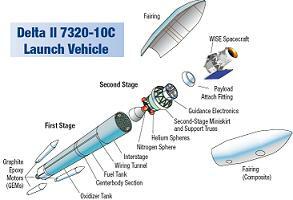 Only one Delta II launch is scheduled for 2010, which will be of a 7940 configuration, and will carry the Italian COSMO-4 satellite. The next scheduled ULA launch is of an Atlas V with the Solar Dynamics Observatory, which is currently planned for 3 February. The day before, the SpaceX Falcon 9 is slated to make its maiden flight in what is currently scheduled to be the first US orbital launch attempt of the year.